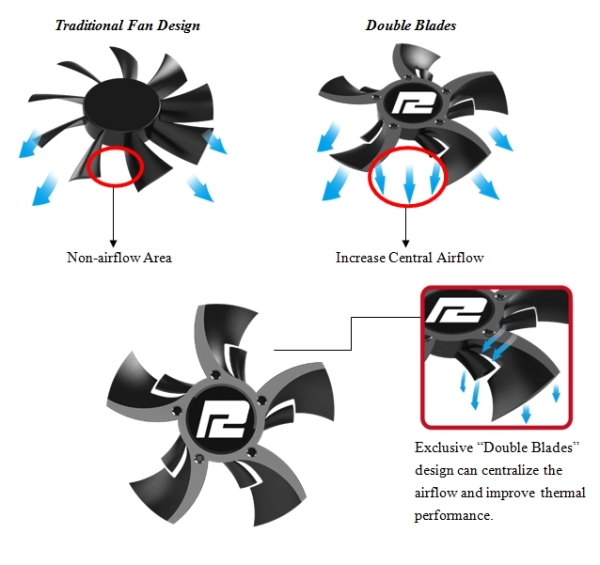 PowerColor has announced a new series of cooler fan with double blades, which were developed in collaboration with its constant partner, Double Blades. New design adds additional fan blade which is actually connected to source and can absorb the air flow at the center, thereby providing up to 20 percent greater air flow than conventional thermal and existing structures. The new design also prevents the accumulation of dust in the bearings and / or at the bottom of the fan and extends the life of the cooler, as well as the video card. Of course the performance enhances when the devices get cooled or at normal temperature. The total outcome of the device is less as it gets heated. According to Powercolor / TuL, Double Blades new design will be implemented in future new video card coolers and will be among the first graphics card based on the Volcanic Islands. Of course, if AMD will give the green light on custom designs, not referred to the reference.